What’s better! Electric or manual toothbrush? Brands, products, reviews, in shops or online, being a consumer is more like entering a maze and hoping you find an exit preferably with some goods. When it comes to oral health, choosing the right dental care products is essential to each individual; no smile is the same therefore neither is the care. 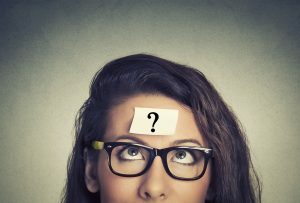 If you thought that finding the right product was hard enough, its then distinguishing between which brands, which are of course battling for your buck. Generally, with the amount of information available to us, we are investing more time in getting value for our money; this is exactly why you’re reading this post, and exactly why rates are becoming more competitive. Promotions, discounts, and freebies, although it may be saving you on cash, it could be costing you on your over health. Research suggests your oral health has a direct link to your overall health. Therefore it is important to take into consideration which products are effective and right for you. Before we get into choosing the right toothbrush, one thing that most of us don’t take into consideration is a brushing technique…there’s a technique! 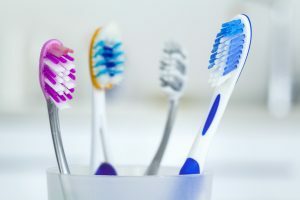 In order to maintain good oral hygiene, adhering to an effective brushing technique is paramount to which type of toothbrush you are using. For more information on brushing technique, click here. Bristle Variety - Firstly let's throw out the misconception that soft bristles on a brush are not cleaning your teeth as much as hard ones. Toothbrushes with soft bristles are usually recommended for adults as well as children, and more so, for those with sensitive teeth or gums. In actual fact toothbrushes with hard bristles have not been proven to be more effective in removing bacteria build up or the development of plaque and stains on teeth. What they can do when used incorrectly is cause damage to the gums and teeth. Size matters – When choosing a manual toothbrush it is important to get the right sized toothbrush head. Your toothbrush should easily move around your teeth, managing to get to each surface. If you have a smaller mouth it may be worth opting for a compact head. There are also specially designed toothbrushes for infants and children; these are small toothbrushes with soft bristles. Variety - Manual toothbrushes come in different sizes and styles, therefore you can rest assure there will be one for you. Affordable as well as Accessible – Manual toothbrushes are sold in a multiple of different stores and are not high in cost. Portable – manual toothbrushes do not need to be charged, nor do they need a battery or power supply. They can be used anywhere at any time. Brushing technique is essential – When using a manual toothbrush, you must have the proper brushing technique to effectively remove bacteria and plaque from your teeth. Timing – Most electric toothbrushes have an indicator on when 2 minutes (being the recommended minimum time to properly clean your teeth) is up. It may also take longer using a manual brush to clean your teeth as effectively using an electric toothbrush. Electric toothbrushes similar to a manual toothbrush can come in many different head sizes and different styles. However, with the electric toothbrush, things get a little bit more technical. We have the sonic, the ultrasonic and the oscillating-rotating. Sonic brushes use vibrations rather than a repeating motion; these intense vibrations, polish the teeth as well as push toothpaste between teeth for a more effective clean. Ultrasonic, as the name suggests, takes sonic technology to new vibrations, sonic waves to be exact, and millions of waves per minute. This is even more effective in polishing teeth, and more importantly removing food and bacteria from in-between teeth. Oscillating-rotating uses a repetitive motion to recreate an effective brushing motion. Additional features – With modern technology electric toothbrushes can come with additional features, which can cater to individual needs. This can include pressure sensors (for those brushing too hard), tongue cleaning modes, Bluetooth for real-time feedback on your oral habits, timers and much more. 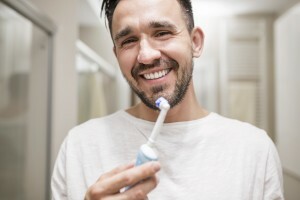 Financial Investment – As electric toothbrushes do not come cheap, this can give people more of an incentive to use their toothbrush, which is helping them maintain good oral health. Braces and dental fixtures – It becomes more difficult to be able to clean between teeth with braces and fixtures. With an electric toothbrush, it is easier to clean between teeth as well as in between fixtures. Health Conditions – Some health conditions can inhibit the mobility of your hands such as arthritis or multiple sclerosis. Those with a loss of dexterity can benefit from using an electric toothbrush, with a bigger handle and less physical motion of “brushing”, this can make cleaning teeth easier. Cost - Electric toothbrushes are a lot more expensive when compared with the manual toothbrush; electric toothbrushes can vary in price and can exceed one hundred pounds. Sonic electric toothbrushes are usually more expensive than oscillating or rotating ones. Portability – Electric toothbrushes need to be recharged therefore having access to a regular power port is an essential. Electric toothbrushes are larger and usually have travel cases, taking up a lot more room than travelling with a manual toothbrush. Ops – Electric toothbrushes are a lot easier to break, I’m not sure how a manual toothbrush would particularly break as such, but I’m sure it’s happened. Electric toothbrushes with all their mod cons, sonic vibrations, and rechargeable batteries mean that there is a lot more to go wrong. If your electric toothbrush does break, buying a new one is costly. Your toothbrush or toothbrush head needs to be replaced every three to six months, but it should be replaced earlier if the bristles spread out or become frayed. THE REAL QUESTION - Do electric toothbrushes clean your teeth better than a manual toothbrush? The answer is YES. Using an electric toothbrush is easier to use as well as getting desired results for a deeper clean. It has been proven that using an electric toothbrush for six months can significantly reduce plaque accumulation, therefore reducing your risk of gingivitis and periodontal disease (also Known as Gum disease). Does this mean that you cannot clean your teeth effectively with a manual brush? NO. Adhering to a good oral health regime, such as brushing correctly, flossing and regular dental check-ups. Will ensure that whatever brush that you choose, you can maintain good oral health. Is your choice! With all the information, articles and expert opinions, it is your own personal preference and what works for you, which should be your deciding factor. As long as you commit to an oral health regime, and are using the correct techniques in the products that you use. Whatever your choice, your oral health should improve or be maintained.